THE FRENCH COUNTRYSIDE COMES TO THIS NORTHEAST HOME THROUGH ARCHITECTURE AND ANTIQUES. IN THE FOYER are several antique pieces: a Swedish grandfather clock, an antique cabinet the homeowners found at a French flea market and an antique doll they also found on their travels. WHEN YOU FALL IN LOVE WITH FRANCE WHILE ABROAD, what do you do when you get home? You turn your home into a French haven, of course. 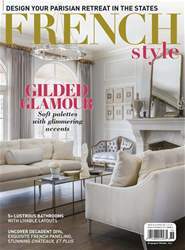 When interior designers Bunny Williams and Elizabeth Swartz of Bunny Williams Interior Design came on board to help redesign this home in the Northeast, they knew that French style would be the inspiration. The 10,000-square-foot house wasn’t new, and it was time for some updates and a full refresh. “We redid all the bathrooms, kitchen, floors and moved some walls”, Elizabeth says. “All this was while we kept the integrity of the house.” When it comes to a large remodel like this, there’s a careful balance between updating the interiors while keeping the aspects of the home that caught the homeowner’s eye in the first place. If too much of the design is new, the older aspects that provided so much character will disappear. At that point, you might as well have built a new house. But that’s not what happened with this French beauty. Bunny and Elizabeth teamed up with Archer and Buchanan Architecture to upgrade the spaces while still maintaining the architecture that made the house so charming. “We played up the architecture and kept many existing elements”, Elizabeth says. For example, the intricate mantel and hearth in the dining room are original as is much of the trim and other detailing. “We kept the original library but painted it a dark, glossy black to enhance its features and hide an unattractive wood finish”, Elizabeth says. By using paint and making the changes subtle, the home retains an antique feel, which pairs perfectly with French style.